DavidsTea Inc. (DTEA.O) reported a more than $9-million loss in its most recent quarter that was marked by wild share price swings, but the retailer's co-founder, who led a recent shareholder revolt, says he's confident in the tea purveyor's ability to turnaround its financial performance. The Montreal-based retailer reported Thursday that its consolidated net loss surged 40 per cent to $9.1 million or 35 cents per diluted share for its third quarter ending Nov. 3. That compared with a net loss of $6.5 million or 25 cents per share for the same quarter the previous year. Shares were trading sharply lower in early trading Friday. Its adjusted net loss was $7.4 million or 28 cents per share compared with a $4.5-million loss or 17 cents per share in the third quarter of its 2017 financial year. “We are seeing favourable trends in several areas of the business,” said Herschel Segal, who is serving as interim CEO, during a conference call with analysts after markets closed. The call lasted less than 15 minutes and analysts were not permitted to ask questions, a customary practice for most quarterly calls. Segal took over as executive chairman of the company's board and interim CEO earlier this year after 54 per cent of shareholders at the annual general meeting voted in favour of Segal's slate of seven directors over the management nominees. The loss prompted then-CEO Joel Silver to resign. At the time, Segal pledged that the chain will become profitable within a year. For the second set of quarterly results under his leadership, sales increased 1.5 per cent to $43.7 million from $43 million in the same quarter of 2017. 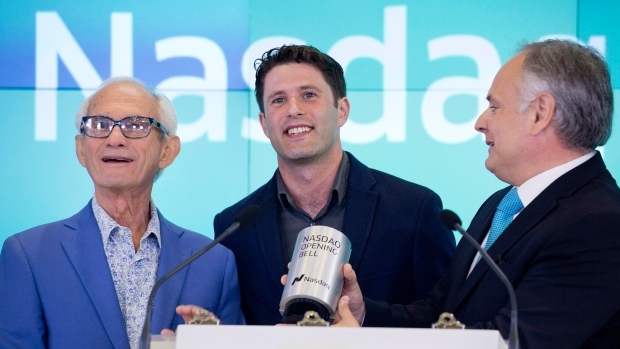 DavidsTea's online sales account for 16 per cent of its volume and the company needs to increase this portion of its business significantly, he said. Sales of its tea sachets in 450 Loblaw stores, as well as on Air Canada flights, and in certain hotels and offices is going very well, he said. Still, same-store sales fell 4.7 per cent during the quarter. That drop reflects the company's decision to reduce its dependency on discounting, said chief financial officer Frank Zitella, who started in the role this week. That resulted in less product available for the retailer's semi-annual sale, he said. First, on Sept. 21, shares soared nearly 60 per cent before plummeting about 25 per cent at close. The following month, on Oct. 2, shares closed up about 63 per cent from US$2.55 to US$4.16. The company did not comment on this during the call, though some suggested the activity came from speculation DavidsTea might be looking to somehow enter the cannabis space. The shares closed up 10 cents or 5.3 per cent to US$1.99 in Thursday trading.